Here is some tax information that I discovered when enquiring about printing a book through Amazon’s Create Space platform. As a US company, non-US authors will have to get around the 30% withholding tax issue. It can be tricky, if you don’t know quite where to go and how to do it. So, here’s the best way that I found, which takes around 15 – 20 minutes. Don’t bother with an ITIN (International Tax Identification Number). Go for an EIN (Employer Identification Number) instead. To get your EIN, call the IRS at +1 267 941 1099. Do not call the international number on the IRS website – this number is always engaged, and will just hang up on you. The number above is a direct line to the dedicated unit in Philadelphia that deals with foreign entities (that’s you) who need an EIN. Tell them you need an EIN, as you are an author who wants to publish on the American Amazon’s Create Space platform. Then, give them all your details, and they will then give you your EIN number. Keep this number safe! When you’ve gotten as far as you can on the Create Space site in uploading the files of your work, etc., you will need to fill in tax information through Create Space before you can continue any further. Go to that page, and tick the “I have a Foreign/Non US tax number” (currently the third option on the list). You will be asked to review all your details, and then submit the forms. Do so, and voila, hey presto, you’ve done it! You can now carry on with uploading files and creating that brilliant piece of work. Note: Some countries have different tax treaties with the US, so for example the UK has 0% tax payable. Other countries may differ. The online form through Create Space (W-8BEN) will automatically go to the right country code on the form and show the appropriate percentage of tax for you. The information in this blog post is correct as of the date published – it may change in the future. Dancing With Nemetona now available! 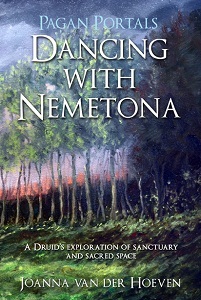 My latest book, Dancing with Nemetona: A Druid’s Exploration of Sanctuary and Sacred Space, is now out – two weeks early! Only 8 copies left on Amazon – grab yours now! Dancing with Nemetona available for pre-order! New book coming out May 2014! My latest book will be coming out in May 2014 with Moon Books Publishing, as part of their Pagan Portals series. This series is a set of introductory books, usually 25,000 words or less, on a topic that allows the reader to gain an foothold on a subject, and then inspire them to continue to find out more on their own personal journeys. This is the second book I have written for the series, the first being Zen Druidry (see my Books Page for how to buy). Nemetona is an ancient goddess whose song has flowed from Europe into these isles, humming softly deep within the earth and also deep within the human soul. She is the Lady of Sanctuary, of sacred groves and sacred spaces. Not much has been recorded of her academically – we know of an altar in Bath that was dedicated to her by a Gallic artisan who felt her power and carved her elusive name for us to remember down through the ages. She is present within the home, within our sacred groves and rites and in all the spaces that we hold dear to our hearts. She also lies within, allowing us to feel at ease wherever we are in the world, through her energy of holding, of transformation. She holds the stillness and quiet of a perfect day, she is the stillness at the end of it, when the blackbird sings to the dusk. She is Sanctuary, where we can stretch out our souls and truly come alive, to be who we wish to be, filled with the magic of potential. Rediscover this ancient Goddess and dance with a Druid to the songs of Nemetona. Learn how to reconnect with this goddess of sanctuary in ritual, songs, chants, meditation and more. Ritual – the word rolls off the tongue. It evokes images of moonlight and standing stones, or incense and flower filled temple rooms, women and men gathered under the stars or the light of day to celebrate an aspect of life, death and rebirth. Ritual is as simple or complex as we allow it to be. We can follow a set liturgy, or we can create our own path. Within paganism, both are equally acceptable. As paganism is, technically, a newly rebirthed religion the question of authenticity with regards to validity is moot – someone, somewhere along the line, whether it was 60 years ago, 600 years ago or 60,000 years ago made it up at some point. That has no bearing on its validity. When we create ritual, we are taking a moment, taking time out, to celebrate or honour a specific moment in time. It may be as simple as saying a prayer of thanks at sunrise or sunset, or it may be a full blown affair held within a stone circle, with 20 or more participants, having rehearsed their roles and re-enacting a mythic drama. Whatever ritual you choose to perform, establishing a relationship with Nemetona can be a rich and rewarding experience to lend to these sacred acts. Nemetona is Lady of the Sacred Grove, where it is believed that ritual occurred in past history. The ritual itself is just as important as the setting. It must speak to us, must sing to our soul, otherwise, what is the point? As the Lady of Holding, of guarding and watching over our sacred space, our created sanctuaries, Nemetona is also a lady of ritual, integral to it if we so desire. 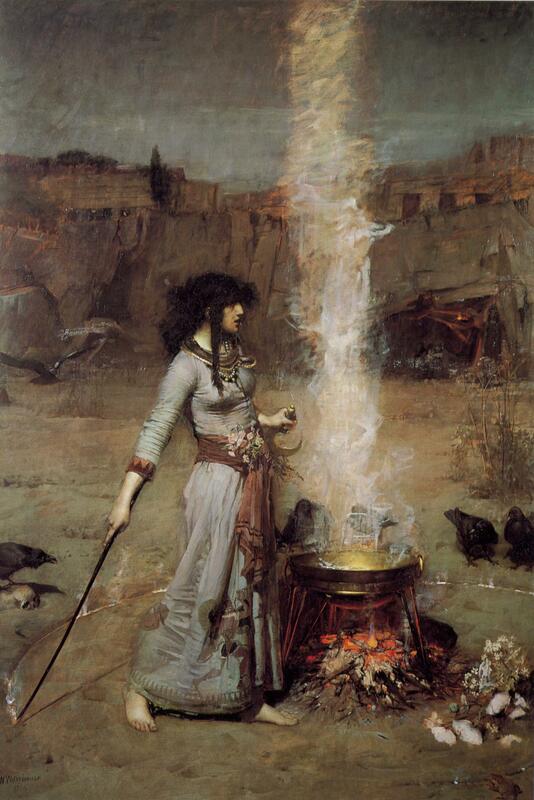 She moves in circles and in cycles, and therefore when we hold a ritual circle, we can invoke her easily within that sacred place. She is all that is within the sacred circle, and also all that is without. Like a vase, the vase is not only the boundaries of its own edges, but also the emptiness within that allows it to be a vase. We can call upon Nemetona in ritual, to protect our sacred circle, to bless it, or simply to witness what it is that we are doing within that space (or all three). She can be called upon before a ritual to help define its intent and purpose. She is the Lady of Holding, and within her embrace we are free to be and do as we wish. Within the sacred ritual circle, she enables change and growth, safety and security where we might otherwise not feel it to be. Within the ritual circle is a space where we can grow, where we can make associations and develop our spirituality to its true potential. Within the sacred circle, we overlay it with our associations in ritual such as the elements, our spirit guides, ancestors, gods and goddesses and more. By finding out where these “fit” in the sacred ritual circle, held within the arms of Nemetona we come to truly understand ourselves, and the greater world at large. As well as external, physical manifestations of sanctuary, there are also inner sanctuaries that we can create, filled with the blessing and the power of Nemetona – a space where we can feel safe, a place where transformation, healing, integration and all manner of things can take place. Some Druid Paths construct what is called the Inner Grove (a place of ritual and transformation in the mind) and that shall be dealt with in a different chapter on sacred groves. What I would like to suggest here is not so much an inner ritual arena, but a safe place to use as a “base” – I like to think of it as my Inner Hut. Creating inner worlds is not only great fun, but a great way to express and confront issues that we physically may not be able to, or which may not be appropriate to do. Several of my teachers have used the idea of an inner safe place which we can use as a starting point, and from there travel out into the wider realms of the mind, exploring what we need to explore. We may have fantastical adventures in our inner worlds, or enjoy the more mundane things within them that we may not have the time to do in our physical world. The Inner Hut provides the starting point, the sanctuary. My Inner Hut is a place that I can go to in meditation, when I am called to journey, perhaps, or when I feel I need to really take a good look at something that is troubling me in my life, or when I simply need to be refreshed by the blessings that particular sanctuary provides. If an answer isn’t available in the so-called mundane world, one may be found in the inner world. My Inner Hut is a simple, single-room dwelling deep within the heart of an ancient forest, close to a slow-moving river that winds its way through the trees and out into the wider world beyond. 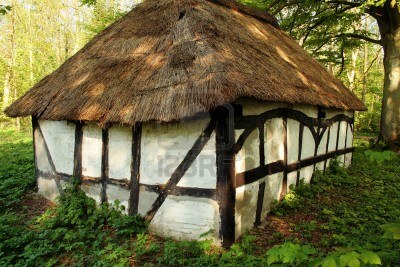 It is a simple wattle and daub hut, with a thatched roof that occasionally needs repair and a dirt floor. Inside there is a table in the centre, with two benches on either side, a bed along one wall and a chest at the foot of the bed. There is a much-used hearth on the back wall, and a good stack of firewood both inside and outside the hut. There is also a chair pulled up near the hearth, and a large wooden basin on a separate smaller table under the window. Herbs are hung to dry from the ceiling, and my staff leans in the corner by the door. This hut is my safe space and my starting point for any adventures that I may wish to undertake in the inner realms. Sometimes it is simply enough to just spend some time in the hut, or around it, looking at the herbs growing nearby, sitting by the river’s edge and watching the water flow past. If there is an issue to deal with, I can either deal with it in this safe space, or venture further out into the woods to find just what it is that needs to be taken care of, knowing that I always have this safe haven, this little sanctuary to return to should it be needed.